There were once four brothers who were the finest hunters in their tribe. No one was better. One day, when the cold nights were beginning to return, the brothers received a message — a powerful bear had appeared. 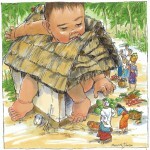 It was so big and terrifying that people thought it must be a monster, and all the villagers were terrified. Children no longer played in the woods, and at night the men stood guard. Each morning there were enormous tracks just outside the village, and the people knew the monster was becoming more and more bold. 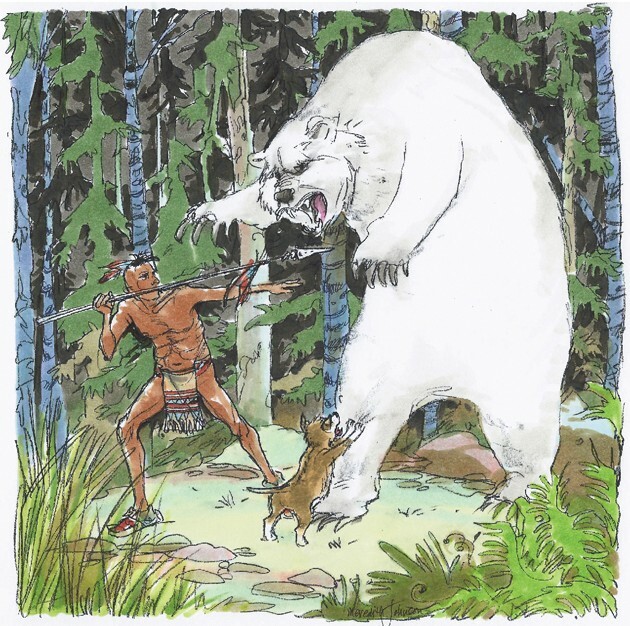 One morning, the brothers set forth with their little dog to hunt the bear. As they entered the woods, they found no sign of any other wildlife, only scars on the bark of the pines where the bear had marked its territory. The tallest brother reached up as far as he could, but even he could not touch the highest marks. Everyone knew that Nyah-gwaheh had magical powers. 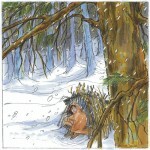 The elders had taught them well: If a hunter found the tracks of Nyah-gwaheh, he was in luck. The monster bear would run away. But those who could not find the trail would be lost to it. The four hunters and their small dog reached a village where they found all the doors to the long houses closed; men stood outside holding clubs and spears, and everyone looked hungry and terrified. “We’ve come to help you get rid of this monster,” the brothers said. “We never stop once we are on a trail,” said the third brother. But the fourth brother, who was the laziest, whispered, “I think we should eat before we set off.” The other three did not listen. They turned to leave, following Four-Eyes, who kept lifting his head, looking around intently. His brothers paid no attention, for they could feel the presence of Nyah-gwaheh. They knew if they did not soon find its trail, it would make its way behind them and they would become the hunted. 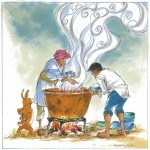 The lazy brother took out his pemmican pouch and shook out the food he had prepared so carefully before they left home. But instead of pemmican, the magic of Nyah-gwaheh had turned it to worms. This made the lazy brother angry, but just as he was about to complain, the brothers saw a pale shadow cast against the trees. They looked up and saw flashing red eyes. Their dog reared up, and the monster bear turned to run away. For the first time, the four hunters saw the creature’s gigantic white shape. 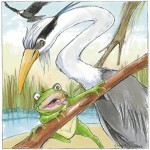 They let out loud, hunting cries and gave chase across a trail of swamps and thickets. Nyah-gwaheh had pushed aside everything, leaving a trail easy to read. On they ran across the swamps, into the valleys, until at last they came to the slope of a mountain. Still they ran, chasing Nyah-gwaheh up the trail that led higher and higher. Over each rise, they caught a glimpse of the creature, and then it again disappeared. And so two of the brothers carried their lazy sibling and the third carried his spear. They ran more slowly as day turned to night, until they found themselves at the top of a mountain. They could see the monster bear ahead; it was growing tired, but so were they. “Put me down, I’m better now,” said the lazy brother, and now that he was rested, he grabbed his spear and dashed ahead. Nyah-gwaheh heard his cries, and it turned ready to attack, but the lazy brother thrust his spear into its heart. They cooked the great creature and ate until the lazy one was satisfied. It was then that one of the brothers looked down and saw they were not on a mountain at all. Nyah-gwaheh had flown to escape the hunters, and their determination to reach it had carried them up into the sky. The hunters looked and saw that where there had been a pile of bones, the bear was coming back to life, rising to its feet. The dog barked as once again Nyah-gwaheh began to run. The first brother said, “Follow me,” and grabbed his spear. Again, the brothers gave chase. People say they are still hunting that bear. Every autumn they chase Nyah-gwaheh across the sky. When they reach it, they cut up the bear for their food. Its blood falls from the heavens and turns the leaves red. The fat dripping from the hunters’ fire turns the grasses pale. Time passes, though, and when the sky turns toward spring, Nyah-gwaheh rises once again, and the chase begins anew.